You are here: Home / Entrepreneurship / How Small Startups & Small Business Owners Can Expand? Are you a startup or a small business owner trying to expand? Here are few points to consider as you are expanding. I have been a significant part of an actively expanding web development company and have made so many mistakes that have checked our expansion. We still managed to expand for quite some time now and so let me share with you some key mistakes that we did that you should not do. I am not a fan of hiring people in-house but once you are a web development company with few people working for you, you always tend to have an option of outsourcing versus hiring a person in house. You can get a web developer with a couple of years of experience and salary expectation of around 15,000 INR per month in Kolkata. The challenge is, you may have enough work for him when you hire the person but can you also have enough work for him month after month. If you are trying things out, it makes much more sense to be outsourcing instead of hiring the in house. Outsourcing has a very big advantage of saving you real estate space that has to be provided for in-house person to get things done which is can add a lot of hidden cost to your pricing. Finding the right person to outsource can be challenging as well, but it is part and parcel of outsourcing. More often it is all about hit and miss. You have to keep trying few people till it’s not a miss. Small business tends to have a list of todo things that are mainly driven by sales and not to build a brand with marketing. Marketing is also a very important aspect to any business be it small or large. As a startup or small business you don’t need to put tons of money into marketing and building a brand but you can always have a small budget for marketing. It can be just as low as 2% of your total income. Marketing done rightly will eventually lead to more sales but only focusing on sales to build your brand may not work. If you pay peanuts, you will get monkeys. Follow it religiously and hire the best possible person to work for you. Don’t get me wrong when I say the best possible person to work for you. As a startup or small business you may not have the willingness of the best person to work for your company. Nevertheless it is not about the best person, it is about the best possible person. If are given a choice to hire a person who has a low expectation of salary Vs higher expectation of salary, opt for the person who can add more value to your company and not the person who has the lower salary expectation. Mediocre people with minimal salary expectations may not always be the right person for your company. 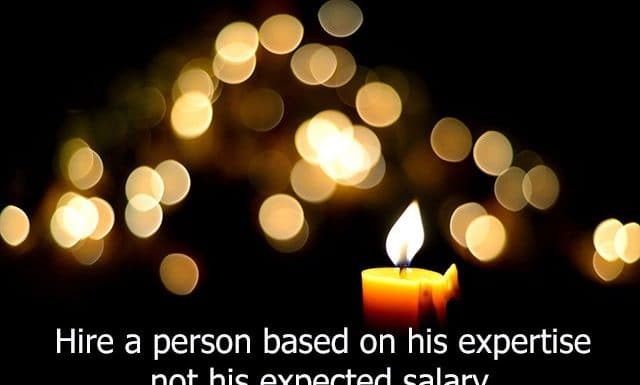 Hire a person based on his expertise and not his expected salary. Every business needs to hire people and if you are unable to find the right talent, opt for the other options like a job site (naukri.com / monster.com) or putting your opening in the local newspaper. You may not always find the right person you are looking for from your contacts only. Once you are stuck, always consult an expert to get you the best possible solution. You may be unable to hire an expert for full-time but then part-time expert for consultation is always a good option. His couple of hours may be sufficient to get you advice that can be reaped for years to come. Example once you are sick, you go to doctor but when you have some serious health issues, you don’t go to a general physician but a specialist. A penny saved is a penny gained but should you focus on saving a penny or a dollar? You should not only focus on growing your topline but work on growing your bottomline as well. If you aren’t sure what top line and bottom line is, here is a link to my investment analysis blog that explains what top line and bottom line is in much more detail with examples. Can you partner with someone to do business in your name and build a brand for your company? If you can find somebody who can do the job for you based on your brand value, you can always opt for giving him/her a franchisee. If you cannot offer a franchise, form an alliance because it is not all about you alone, you have to do things with a team. As you are looking forward to expand, you can always stumble upon with a surprised opportunity. It can be confusing whether you should be going for it or should focus on things you have been doing. Can be a difficult decision to make, but if it is something within your expertise of understanding, you can always try it out and add a diversified source of income to your business. Companies at the verge of bankruptcy or getting closed are a good acquisition option for startups as it helps you not only acquire a few clients to jump start your expansion plans but also acquire some great talent that can help you revive the acquisition. The reason for bankruptcy of existing management could be they did not listen to their employees which can lead to an approach for the acquired business to not only supplement your business growth but also help you give path to saving your business from being bankrupt in the future. No matter what, expansion is the best damn thing that can happen for a startup or small businesses. No matter what anyone suggests, you should always be thinking about expanding. It’s definitely important to invest in marketing. Now, what kind of marketing you invest in is entirely up to you, but make sure that it’s the right method. Small businesses typically don’t have large budgets to spend on marketing, so spend wisely! Agree. Its all about being smarter when it comes to marketing.